Ocarina of Time 3DS to Release June 2nd? According to a recent news post over at Kotaku, Ocarina of Time 3DS has a confirmed released date of June 2nd as well as a price of $39.99. The initial source of this piece of news is GameStop, which immediately made me question the source, since GameStop has been a terrible source for release dates in the past. However, Kotaku seemed to be just as suspicious and they went ahead and contacted a whole range of GameStops and were able to confirm that June 2nd was the listed release date. There is a whole listing of games at their website with their release dates, but this is specifically what they had to say in regards to the list. To me the whole thing still seems fishy. Why was Ocarina of Time 3DS confirmed but not… Kid Icarus? Especially if they are both Nintendo franchises. Secondly, why is it that it is GameStop, via Kotaku, that is distributing this information and not Nintendo themselves? Heck, even in their press conferences they listed a bunch of games that will appear in the launch window and they seemed to specifically not list Ocarina of Time with that grouping. Take the June 2nd release for whatever you think its worth. According to Kotaku, it is confirmed and is the only title that is not subject to change. Strange indeed. 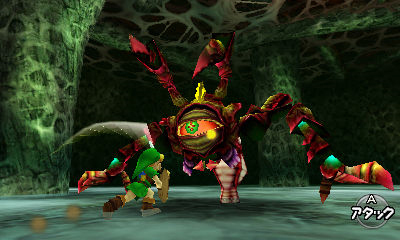 Here at Zelda Dungeon we already have a completed Ocarina of Time Walkthrough, but we fully plan on updating it so that it is Ocarina of Time 3DS Walkthrough compatible, listing all, if any, in-games differences between the versions. Be sure to stay tuned for any news in regards to the game.